Babies begin to learn about the connection between pictures and real objects by the time they are nine-months-old, according to a new paper in Child Development. Babies can learn about a toy from a photograph of it well before their first birthday, the scholars from Royal Holloway, University of London, and the University of South Carolina found. Researchers familiarized 30 eight and nine-month-olds with a life-sized photo of a toy for about a minute. The babies were then placed before the toy in the picture and a different toy and researchers watched to see which one the babies reached for first. 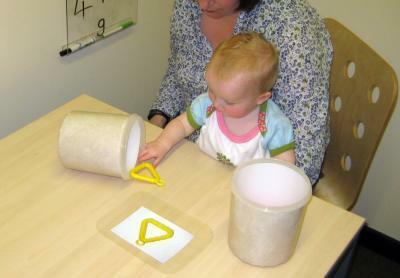 In one condition, the researchers tested infants' simple object recognition for the target toy by keeping both objects visible, drawing infants' attention to the toys and then placing the toys inside clear containers. In another condition, they tested infants' ability to create a continued mental idea of the target toy by hiding both toys from view, drawing infants' attention to the toys and then placing the toys inside opaque containers. When the toys were visible in clear containers, babies reached for the one that had not been in the picture, suggesting that they recognized the pictured toy and found it less interesting than the new toy because its novelty had worn off. But when the toys were hidden in opaque containers, babies showed the opposite preference - they reached more often for the one that had been in the photo, suggesting that they had formed a continued mental idea of it. "The study should interest any parent or caregiver who has ever read a picture book with an infant," said Dr Jeanne Shinskey, from the Department of Psychology at Royal Holloway. "For parents and educators, these findings suggest that, well before their first birthdays and their first words, babies are capable of learning about the real world indirectly from picture books, at least those that have very realistic images like photographs. It also demonstrates that experience with a picture of something can strengthen babies' ideas of an object so they can maintain it after the object disappears - so out of sight is not out of mind."